Finally, Homemade Brownies as Good as Boxed Brownies! Homemade Brownies as Good as Boxed! We don't do a lot of sweets around here, but sometimes you just need a brownie! You'll love this recipe because it doesn't have all the icky stuff like the boxed brownies, but has all the same taste -- with good-for-you ingredients. Try these homemade sundae toppings on your brownies! Let me know what you think when you try them! If you have a different homemade brownie recipe, please share it with us in the comments. 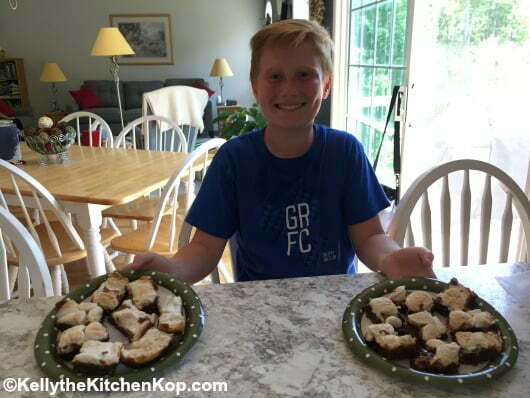 Another idea that our son wanted to try and it was so good: Get more natural marshmallows like these, cut them into halves or quarters if you want smaller hunks, and put on top the last 10 minutes to get toasty and golden. 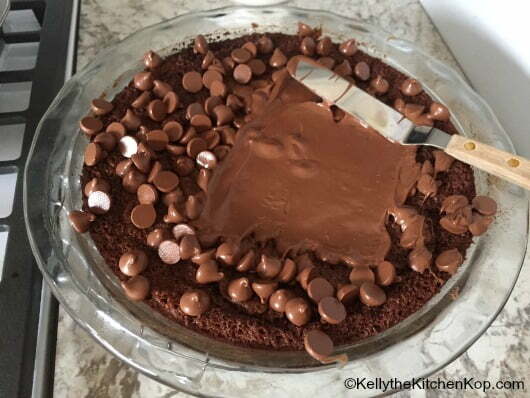 If you want a chocolatey top for your brownies, don't stir the chocolate chips into the dough, and instead wait until the brownies come out of the oven and sprinkle them on the top. Wait a few minutes and spread them around like frosting. Here's where we sprinkled some sea salt on top for an extra burst of YUM. Or for another yummy idea: use the peanut butter frosting from this recipe! 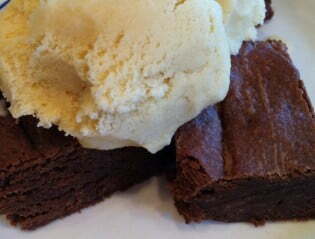 We had these brownies with homemade vanilla ice cream, and homemade real whipped cream, yum! These other organic brownies from scratch that I posted previously are really good, but more cake-like and with a cream cheese filling. Have you tried the baked oatmeal recipe yet? It’s like dessert for breakfast! Check out the comments at this Valentines Day/Organic Chocolates post for loads of information on anything you ever wondered about chocolate! Hello I made these for my son’s birthday..his request for brownies instead of cake. I am very disappointed. I wanted them to be good but healthy. I thought the recipe was odd but went with it. I used stevia…i’ve used it for yrs..however tho it says its equal to sugar in measurements ive felt it was a little stronger..but i use it for tea mostly. I used it and strongly cacao dk choc and well not only did it NOT come close to filling a 9×13-i thought the 4 eggs and 1tsp of salt was odd but went with it. they filled to a barely covering the bottom of half the pan. they rose and cooked thru but they are salty and bitter and the choc chips didnt even melt in them. They would NEVER pass for fudgy brownies. They took forever to make on the stove top half my butter was frozen and i ususally nuke but as i mentioned i went for it. I am very disappointed. Guess i should of stuck w reg unhealthy stuff i mean a birthday comes once a yr. This is not what i want to give him. I wish you would’ve ran it by me first about substituting with Stevia because I would’ve let you know that that just does not work in a recipe like this — I’ve never had good luck with it in anything but beverages. As for the other ingredients, if you make it like the recipe says they’re very good & fit perfectly in a 9×13, my daughter just made them again last week. Recipe sounds good. Is there any easy way to make it gluten free? Made these today! Yum! @ a little over 300 calories apiece they should be! Lol. Loved them so much that i ate 2! 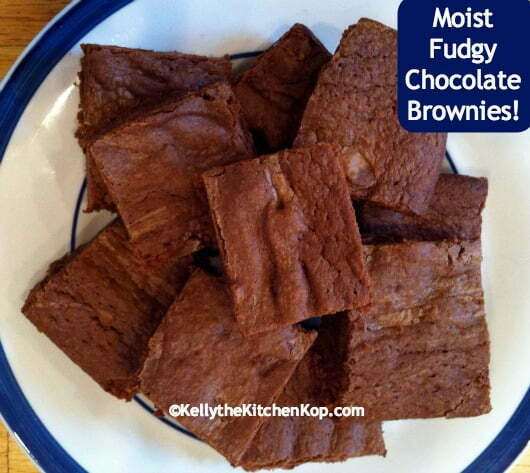 They were moist & fudgy & the edges were just right. I baked for 25 minutes. Better than a box! I’ve been wanting a good homemade brownie recipe & this is it! I used 2/3 cup KA white whole wheat flour & the rest was KA unbleached all purpose. I also used a 10oz bag of ghiradelli bittersweet chips in place of the semi-sweet bars. These turned out great & I am tickled pink woth how they turned out! Hmmm…perplexing to me that anyone would ever consider box brownies better than home made. Have I stumbled into upside down world? Here is the problem with palm shortening: The palm oil producers are clearing swaths as big as 5 football fields of the most diverse tropical forest in our world every single day to plant the monoculture palm forests. These forests contain many many varieties of plants, insects and animals that can be found nowhere else. Once they have been destroyed, they are gone forever, and our world is greatly diminished. Among the wondrous creatures that are being murdered so that we can eat our “healthy” brownies, are Orangutans, the species closest to Human beings. If they are in the way, they are simply run over by the big machines. A photo of the battered body of a young orangutan, skin scraped and bloody, with its arms up in defense, trying to protect its face, is forever burned into my memory. Can you imagine the terror of this innocent creature as its home came crashing down around it and it was relentlessly run down by a giant,noisy, unstoppable machine? Please, please do not contribute to this horror by purchasing palm oil or palm oil products. There are numerous other healthy alternatives. Yes, butter tastes just as good in these! And regarding homemade vs. boxed, as I said, I KNOW! That’s how warped my taste buds were!!! Do you know if what you described is this the case with ALL palm shortening? I’ve been on the hunt too! It’s crazy that the box has some special magic or something, but I can’t get the same consistency and have tried a variety of recipes. Are these gooey soft inside and flaky/crispy outside? @ Cecilia Krueger – I know! That’s how warped my taste-buds were! I’ve been making mine with sprouted rye and a little sprouted amaranth. I seriously believe it is the Best chewy brownie ever! Yay! I too really miss them, so cannot wait to try them! Thank you. I needed to make brownies tomorrow. Thank you for telling me! I’ll adjust the recipe in case oven temps vary even more than I thought they might! I just made these to take to our church’s ladies meeting tonight and they were a HUGE hit! Everyone raved about them! What a great recipe! I’m going to try them with sprouted flour next! I hate how chocolate chips have soy lecithin in them! I have found soy free chips before, but can we just chop up chocolate bars to use? Though would need a GF recipe anyway. My chocolate bar of choice is Equal Exchange 71% dark chocolate. One of the best bars out there. But yes, you could chop up a chocolate bar for “chips”! Trader Joe’s carries organic chocolate bars with no soy lecithin. I’m not sure if they have semi-swee, since we always get the dark chocolate. The price isn’t too bad either! I made these the other day and they were really wonderful.. my gluten, completely non traditional eating bible study ate them up w/o a blink of an eye. I had to have my husband get one out for me because there was not going to be any left..
Why is vanillin bad? I guess I don’t know what it even is, just fake vanilla flavor? I can’t remember exactly why it’s bad, I only know that Jane from the Feingold Association said to avoid it (other options aren’t too tricky to find) because it’s a fake additive/ingredient that causes issues in a lot of kids. Are your brownies Kal approved? I still LOVE that video, he is so familiar, like one of my kids! But your brownies really do look delish, really delish. I just might have to show my oldest daughter. She wants to bake something for Easter. Have a happy Easter, Kelly! Melissa, yes, they ARE Kal approved, LOL! It just occurred to me that posting that recipe might have been rude. I apologize. 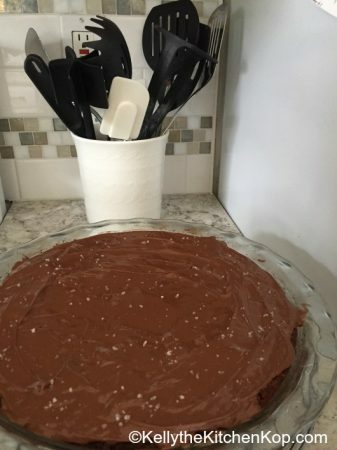 My favorite fudge brownie recipe comes from Better Homes and Gardens Cookbook. It calls for 2 oz unsweetened chocolate, which I have always substituted with cocoa. Here is the recipe as I make it. It could be improved by WAPF standards, I’m sure! These brownies really are the best I’ve tasted. They have the right amount of moisture. I once gave a china platter as a wedding present, topped with a double batch of these covered with fudge as a frosting. The guests preferred them to the wedding cake. Whisk flour, cocoa and salt together. Heat up butter until liquid. Mix butter with sugar to cool it off. 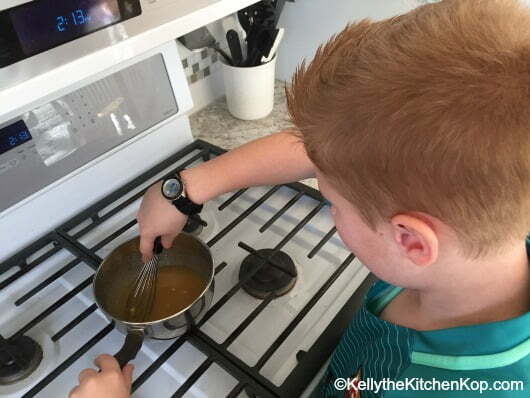 Mix eggs and vanilla into butter-sugar mixture. Add wet ingredients to dry ingredients. Mix well. Pour into 8×8 pan. Bake @ 350F for 30 minutes. Let cool in pan. Invert onto plate and cut into 16 squares. great! I would love to give these a try and you say the brownies dont come out too wet because of the substitution of chocolate rather than cocoa? No, they come out PERFECT. I want some right now…!!! These sound too good!!! I am going to try it using gluten free sourdough. Our family does so much better on sourdough than conventional flours. Wow, kelly…these are sooo pretty. I was going to ask you…no worries, no hurry….how about macarooms?? I saw some in a magazine and for the life of me couldn’t figure out “how do I translate this into a WP recipe?” Can one use Stevia, too? You make it look easier than I thought. There’s a coconut macaroons recipe in Nourishing Traditions! i recently made a brownie recipe with coconut flour so it was gluten free. it had that typical coconut flour texture to it, but they were good. i’d eat them daily if they were around. not as good as regular brownies, but i don’t complain about moist chocolate treats. did i miss the post where you explain why you’re down with palm oil products? what’s the big fuss over palm oil and ruining animal habitats and how do you justify your use of these products the rest of the “green” world is having a tantrum about? I do think butter is a better choice. 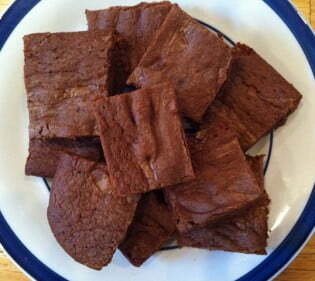 Kel- Have you tried making these brownies with 100% sprouted flour (sifted)? I bet they would be just as good. I prefer sprouted flour. Unsoaked white or wheat flour gives me gas! Yes, I used butter, so I prob wouldn’t switch unless I was out! Yum! My kids will be so happy to have their beloved brownies back! Since I don’t have palm sugar on hand, is it okay to substitute organic sugar?